. Thanks for opening this category. I like to spend time with healthy recipes. so, I hope to see someone like me in this category. This could be the poster-child for clean eating. Light seafood and peas with plenty of protein and fiber make a refreshing yet nutritious combo. When cooking the shrimp, you’ll see them turn opaque and pink, but watch closely so they don’t overcook. It can happen real fast! To stave off possible hunger later, make a pot of rice (extra points for brown rice!) and serve your shrimp and veggies over it. 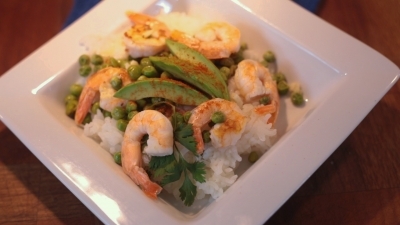 Garnish with sliced avocado, and you’re all set to enjoy this beautiful shrimp and pea rice bowl.